Above: Red Silk Flowers made by me for our wedding. Tonight I'm making some lovely silk flowers for one of the 1920s dresses that I just completed. The dress was inspired by the lovely sheer pink 1929 Vionnet dress on page 468 of the Kyoto 'Fashion' book. My version is made of a sheer blue fabric. I made silk flowers with my mom for my wedding. There they are above in the flower decoration in the corner of the tent. 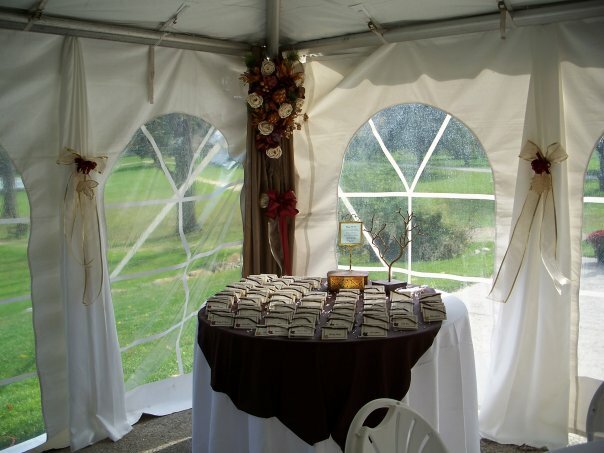 I really wanted to decorate the corners of the tent - but not with real flowers. And I didn't like the look of store bought silk flowers either. Paper flowers were pricey for the amount that we needed, so we put our silk stash to good use and were able to make beautiful red silk flowers for all of the bouquets. I used Martha Stewart's directions for making these lovely flowers. This time around I'm inspired by the tutorial by Mrs. Oyster on the Wedding Bee website. I love the many pictures that she took of the process, and especially her use of a rhinestone earring for the center of her flower. 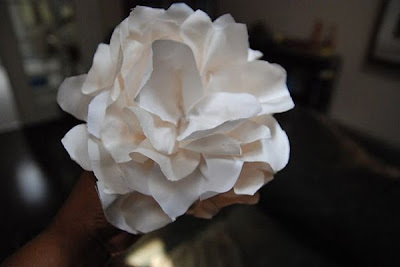 These flowers are super easy and fun to make, and great for those silk scraps that you have left over from previous projects. Thank you for the link, I will definitely be trying it out. I have made a few silk flowers before but with a very different technique (twisting and folding a long strip starting from a knot in the middle) I'm excited to try this out.